Yellow mongoose is the only member of it's genus, but as many as twelve subspecies of yellow mongoose have been described. In general, the yellow mongoose has lighter highlights on the underbelly and chin, a bushy tail, and a complete lack of sexual dimorphism. The yellow mongoose is endemic to and widely distributed throughout Southern Africa. ⧪ The Yellow mongoose mainly feeds upon insects including, ants, termites, beetles and locusts. Their diet also consists of birds, frogs, lizards, small rodents and eggs. 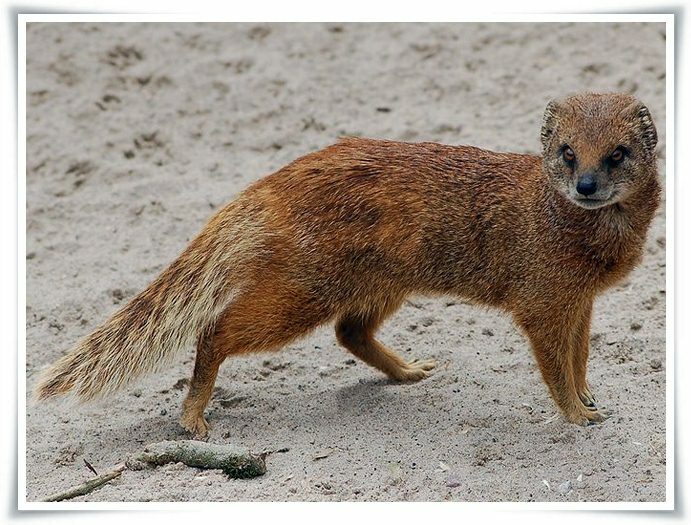 ⧪ The yellow mongoose is smaller than most other mongooses. Within the same geographic region, there is no body size differences between males and females. ⧪ The yellow mongoose is the primary host for a strain of rabies endemic to South Africa. ⧪ Predators of the Yellow Mongoose include birds of prey, jackals, and snakes.